Presently, MTN is running a very interesting program which allows you to get a brand new Nokia Lumia 625 Smartphone, the program is called - "The MTN Phone Upgrade Program". The MTN Phone upgrade program allows you to trade your old phone for a new Nokia Lumia 625 smartphone. What is the Nokia / MTN Phone Upgrade Program? 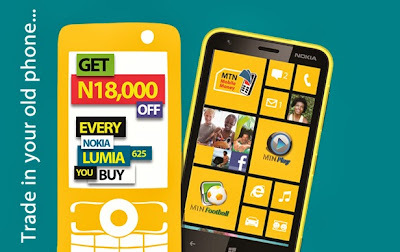 The Nokia/ MTN Phone Upgrade Program is a unique and amazing offer from MTN that offers any MTN Consumer the opportunity to trade selected devices (their old phone) for new Nokia Lumia 625 smartphone. Customer will simply visit selected MTN Stores and swap existing device in good working condition in exchange for a discount of up to N18,000 on the new Nokia Lumia 625. What `selected devices are acceptable for this program? How much in cash would I be refunded by MTN, since discount is offered? You get a discount of N6, 000 off the cost of the Nokia Lumia 625, you also get free Nokia DC-16 Power bank valued at N4,000. Finally you get FREE data up to N8,000 monthly in form of 100% Data bonus monthly on any plan you activate from 250MB and above for 12 months. How does a Customer enjoy this offer? Customer presents valid means of identification and attaches to the form. How about my personal details? How do I transfer them to the new phone? You are advised to back up the data on your old device before submitting the device for upgrade. You can also contact the MTN Tech Squad personnel in the store for help on moving your data. Briefly, According to the information above - just make sure your old phone is among those listed and you must have a good working charger for it, then back up your files. Head to a MTN center with any acceptable means of identification (e.g International Passport, National ID card, Driver's license) and fill an upgrade form then pay for the discounted Nokia Lumia 625. You'll get the new Lumia 625 Smartphone and the free Nokia DC-16 power bank. Kindly share your experience with us if you have visited any of the MTN stores in order to exchange your phone. Hope this helps !!! fantastic. but how much is it?